Kamen Rider ZI-O - Kamen Rider Mach To Appear In Drive Time Line? Recently after the new Japanese era was named, Yu Inaba who portrayed Go Shijima/Kamen Rider Mach from Kamen Rider Drive posted a couple of tweets that he is going to a certain place for a shoot. Could he be hinting that he will be appearing in Kamen Rider ZI-O TV series or in the Kamen Rider Brain spin-off? 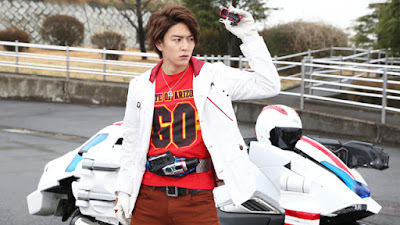 The above tweet mentions that he is interested in joining Kamen Rider Brain for a ride but suddenly ends on giving up on it. If not, could he be the one that Sougo and Geiz will be meeting in Kamen Rider Drive's time line in the Kamen Rider ZI-O TV series? As usual, stay tuned for more news regarding this possible return of Kamen Rider Mach!